MODEL T FORD CLUB NORTHWEST OHIO, INC. The March meeting was held at Jack Putnam's with 15 members and guests in attendance. In the absense of Bob Torbet (president) and Bob Hollister (vice-president), the meeting was led by Jim Cook (unofficial secretary). We all introduced ourselves to the new members and ran through the past and upcoming events. We even got a suprise phonecall from Bob in Florida. A treasurers report was given and the wrap-up of the Jamboree was given. The Jamboree account will be closed by the April meeting if the next club ever cashes their big check. The bank where the Jamboree account was kept is going to start charging for checking accounts. In Jamboree news, the Greater Akron Model T Ford Club will be hosting the 22nd Annual Ohio Model T Jamboree centered out of Richfield, Ohio. The host hotel will be the Days Inn & Suites Richfield (330-659-6151). Please, mention the Model T Jamboree when making your reservations. Camping will be at Streetsboro KOA (330-650-2552). Looking back at the 21st Jamboree that our club hosted - John Riley's DVD of the event was shown at the meeting. It is a great documentery. If you would like a copy of the film that he put together, you can contact him at Albemarle Productions, 492 Leeka Road, New Vienna, Ohio 45159. The DVD is $20 plus $4.95 for shipping and handling. Call John at 937-414-0956 if you have any questions. 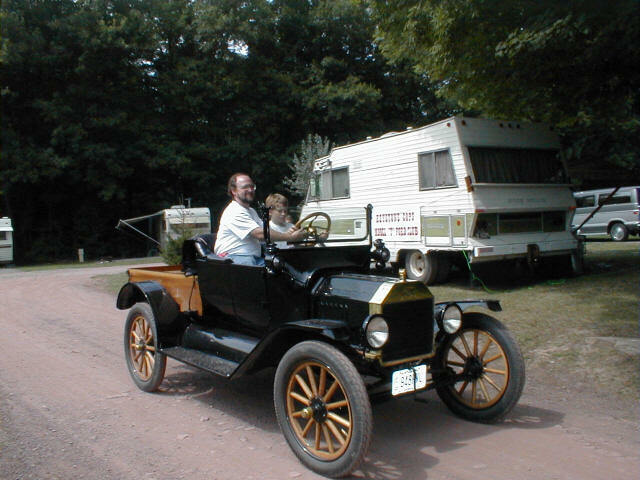 While we're talking about upcoming events, Sauder Village in Archbold, Ohio will be hosting their annual Antique Car Show on May 15, 2010. Antique cars made prior to and including 1942 will be permitted. For each car entered, two adults and all dependent children will be admitted free to the museum for the day. They will also include $16 worth of Sauder Village gift certificates for each pre-registration. The coil doctor demonstration by Brent Mize to be hosted by Kim and Kerry Buchenroth was advertised. Brent has taken the help of Ron Patterson and run with it. He is providing a much needed service to the local Model T nuts. Remember that this club is dependent on its membership to make it work. Everyone is invited and encouraged to input your thoughts and ideas to make this the best Model T club in Ohio. someone who already owned a car. He was selling to new owners. The Model T was meant to last a lifetime. Those that survived the scrap drives have done quite well. Once Frank stopped driving, the T was pushed back into the grainery with all of the other old farm implements. It was brought out on special occasions to remind us all of the family heritage. There it sat year after year recciving less and less attention. Finally it came time to sell the family farm and move the car to a new residence. 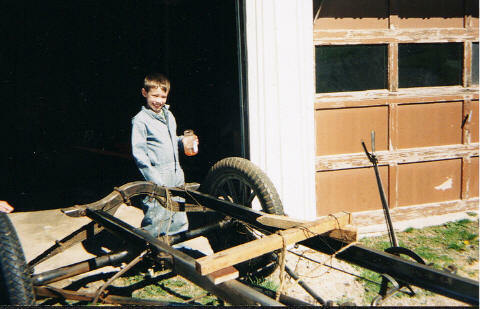 In the early 1990's it moved to Tiffin, Ohio and took up residency in the old garage behind the Cook house. By this time, pieces and parts started to leave. They didn't go far. They just were taken off to polish or sand. ground - up restoration of Old Henry. It took about 9 months of sanding, steel brushing and finishing to turn the rusting, mouse home into a breathing part of history. And so, just like my grandmother, Old Henry was the first car that son Walter learned to drive. These pictures show him cleaning up the frame and then driving the car on private property in Pennsylvania. 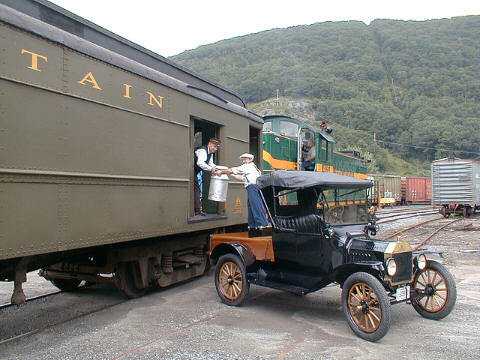 If you would like to tell the story of your Model T, feel free to bring a write up to the meeting with a few pictures. I will be more than happy to include it in the next newsletter.